Villa Campomar is a unique classic Villa situated between the mountains and the Cala Sant Vicens beach. Close to the old town Pollensa this Villa is located in a residential and quiet area, just few steps from the beaches of ‘La Cala’. Fully provided with basics and standards like: private pool, air conditioning, dishwasher, hairdryer, washing machine, etc. Free Wifi is provided and it works very well in every room of the Villa. The area is well known for having the best beaches of the Pollença area (North of Majorca) with crystalline and tremendously cool water There are plenty of leisure activities to enjoy during high season from April to October. Villa Campomar, appr. 150m2 is a spacous Villa with 4 nice decorated bedrooms, a fully equipped kitchen, a cozy living room, a private garden, a BBQ , 2 baths and one private parking place close to the house. Air conditioning is in every room without any addional costs. The Villa is distrubuted on 2 floors. The main entrance leads directly to the lounge on the first floor and is connected to the large terrace with beautiful mountain and pool views. The living room has a TV where you can enjoy after a great day by the pool or beach some DVD´s for entertainment. The lounge area counts with comfortable sofas that accommodates up to seven guests. On the first floor, there’s also the fresh and luminous kitchen, fully equiped with all basics and devices you may need to cook for memorable evenings: ceramic hob, oven, microwave, dishwater, water boiler and a coffee machine..
All bedrooms are located on the ground.floor. There are 3 twin bedrooms and a family bathroom between and one double bedroom with another bathroom next to it. All bedrooms are very airy and bright and have direct access to the mediterranean garden that surounds all the property. All bedrooms counts with bed linens, covers and comfortable pillows. The nice swimming pool with sunbeds and the stone built BBQ is another highlight of Villa Campoara. Villa Campomar is situated in the North of Majorca. Hidden in one of the most beautiful and quiet parts of the island but close to beaches and supermarkets. 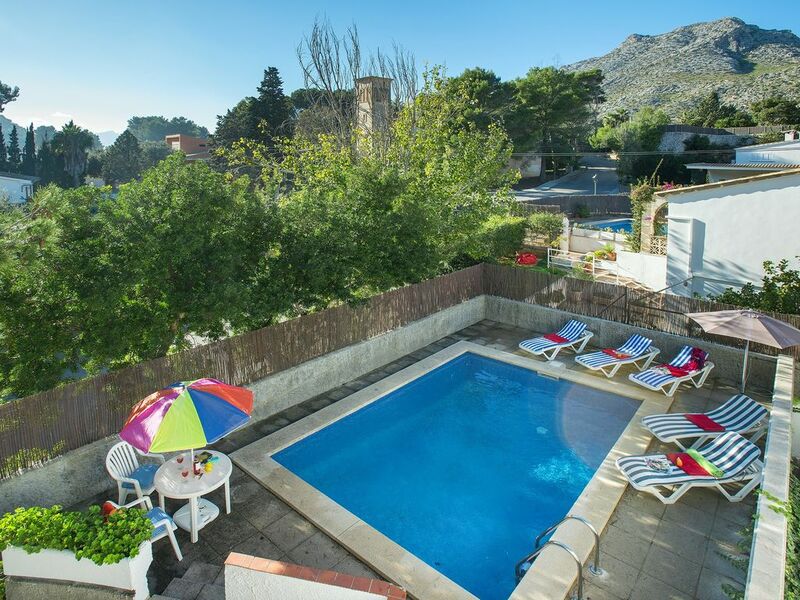 The VIlla is 7 minutes from the charming center of Pollença with restaurants, shops, cultural centers and cafes. Public transport is very close and you can access everything needed by walking distance. Although we recommend to hire a car as you can explore much more the beauty and landscape of Mallorca. Cala Sant Vicens enviroment are little villages, mountains and the sea. The nearest town is Pollença, full of history and with a unique and lovely ambient with bars, cafes & good restaurants. Another village close to Villa Campomar is Puerto Pollença, famous for the beautiufl harbour with fisherboats and yates, the stunning boulevard close to the sea, the shops and supermarkets. There is also a wide variety of water sports available like jet ski, sailing or sky surfing. Another highlight for our hiking and sporty guests will be a walk over the mountain that rounds Cala Sant Vicens to the port. Great scenery and stunning views as its best ! Our calendar is always 100% updated, so if your wished dates are free, be welcome to Book! Passionate about making Villas the perfect place for a fantastic holidays. We are a small holiday rental agency in Pollensa, who manage a limited number of properties in town, so we make sure we can give an excelent service and experience to our guests. We are always available for assistance or support during the holidays time and provide the best information to have a great Majorcan holidays experience. Come and enjoy the paradise while staying in one of our Villas in Pollensa and Puerto! Big Villa with very good location, perfect for summer stays. Just 5 min walk to the beach of Cala San Vicente, and nice garden around the pool. The Villa is clean and well equipped. Nice staff. Thank you so much for visiting Cala San Vicente and our villa. We are pleased you like the stay, and are welcome anytime! Not good for cool rainy weather. This accommodation is best suited for sunny and warm weather. It is suitable for a large group. The welcome basket was a nice touch, although it would have been helpful to have been met personally when we arrived. There was timely response to our weather related electrical issues, although there was no resolution so we had intermittent power for 3 days. This was a great location with good restraunts nearby. Thank you for have been taken your time to write your experience of your stay. We have forward you review to the owner and as well to the property managament agency who is encharged of the cleaning and maintenance purposes to improve the service for future stays. We are really sorry for this. Very spacious house, and nice garden. Lovely mountain views from the veranda. The best is the location, 5 minutes walk to the beach (great blue clean water) and restaurants. Nettes, aber einfaches Haus, genial gelegen, Strand in Nähe. Liebe Gäste Wir danken Ihnen herzlich, das Sie sich die Zeit genommen haben unsere Villa Campomar zu bewerten Vielleicht dürfen wir Sie in Zukunft wieder bei uns begrüssen. Beste Grüsse von Ihrem Owl Booking Team. Absolutely beautiful property. Rented this property(Villa Campomar) for a weekend family getaway and felt right at home. Excellent location, walking distance from the strip (and great restaurants). Very well appointed kitchen(induction stove top!!!). Even with 8 adults, we never felt crowded. Can't say enough good things. The owners were very helpful and responsive with advice on the location of nearby attractions. Overall, great way to experience Villa Campomar. Thank you so much for your visit and stay and for your really nice comments. We are really happy to hear that you enjoyed a splendid stay on our Villa Campomar. Looking forward to welcoming you and your friends soon again.